The cloudy lens is removed from the eye through a surgical incision. In most cases, the natural lens is replaced with a permanent intraocular lens (IOL) implant. A cataract is a clouding of the eye's naturally clear lens. The lens focuses light rays on the retina — the layer of light-sensing cells lining the back of the eye — to produce a sharp image of what we see. When the lens becomes cloudy, light rays cannot pass through it easily, and vision is blurred. Light rays entering an eye with a cataract. When a cataract forms, the lens of your eye is cloudy. Light cannot pass through it easily, and your vision is blurred. There are no medications, eye drops, exercises or glasses that will cause cataracts to disappear once they have formed. Surgery is the only way to remove a cataract. When you are no longer able to see well enough to do the things you like to do, cataract surgery should be considered. When you arrive for surgery, you will be given eye drops and perhaps a mild sedative to help you relax. A local anesthetic will numb your eye and you may be given a small injection to help you feel comfortable during surgery. The skin around your eye will be thoroughly cleansed, and sterile coverings will be placed around your head. Your eye will be kept open by an eyelid speculum. You may see light and movement, but you will not be able to see the surgery while it is happening. 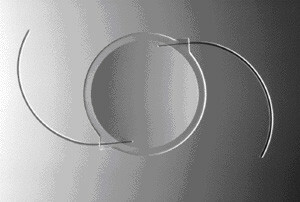 A plastic, acrylic, or silicone intraocular lens is implanted in the eye to replace the natural lens that was removed. 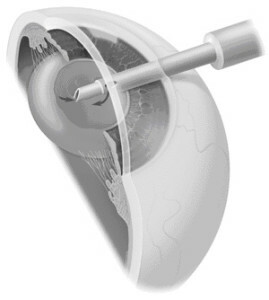 In cataract surgery, the intraocular lens replaces the eye's natural lens. After surgery is completed, your doctor will place a clear shield over your eye. 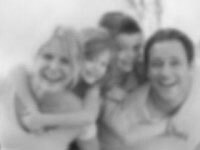 After a short stay in the outpatient recovery area, you will be ready to go home.